129 Marlborough is located on the north side of Marlborough, between Clarendon and Dartmouth, with 127 Marlborough to the east and 131 Marlborough to the west. 129 Marlborough was designed by Peabody and Stearns, architects, and built in 1879-1880 by Weston & Shepard, builders, for Charles William Freeland, one of seven contiguous houses (121-123-125-127-129-131-133 Marlborough) built for him between 1877 and 1880, all in the same design and built for speculative sale. The original permit application for 129 Marlborough was dated November 22, 1879. Click here for an index to the deeds for 129 Marlborough. On April 24, 1880, 129 Marlborough was purchased from Charles Freeland by Nathaniel Walker. He and his wife, Susan White Seaver (Grant) Walker, lived at 90 Commonwealth. 129 Marlborough became the home of the Walkers’ son-in-law and daughter, Oscar Iasigi and Amy (Amelia) Gore (Walker) Iasigi, who had married in December of 1879. Oscar Iasigi was treasurer of the Vassalboro Woolen Mills. After his father’s death in 1877, he assumed his father’s role as Turkish Consul General in Boston. He also succeeded him as the trustee for the American properties of several European estates. On April 11, 1881, Nathaniel Walker transferred 129 Marlborough to his daughter. Oscar Iasigi died in January of 1884 in the wreck of the steamer City of Columbus off Martha’s Vineyard. 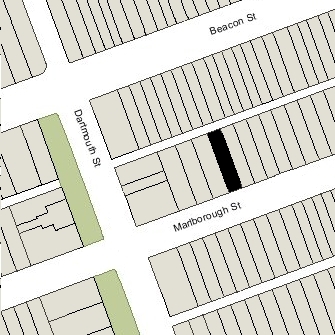 Amy Iasigi continued to live at 129 Marlborough in 1897, but had moved to 244 Beacon by 1898. On May 11, 1897, 129 Marlborough was purchased from Amy Iasigi by Edward Cornelius Briggs. He converted the property into a combination of medical offices and one or possibly more residential units. Edward Briggs was a dentist and a professor at Harvard Medical School. He previously had maintained his offices at 125 Marlborough, which he had converted into medical offices and residential units in the late 1880s. He lived in Milton and later in Lexington. He had married first in November of 1885 to Lou Lord. They divorced in the late 1890s or early 1900s, and he married again in July of 1905 to Ethel Malvina McClure. Edward Briggs and his brother, Charles Poor Briggs, also a dentist, maintained their offices at 129 Marlborough from 1898 through about 1925. A number of other dentists and physicians also maintained offices there. From 1898, Dr. Hugh Kerr Hatfield lived and maintained his medical office at 129 Marlborough. He was a physician and orthodontist. 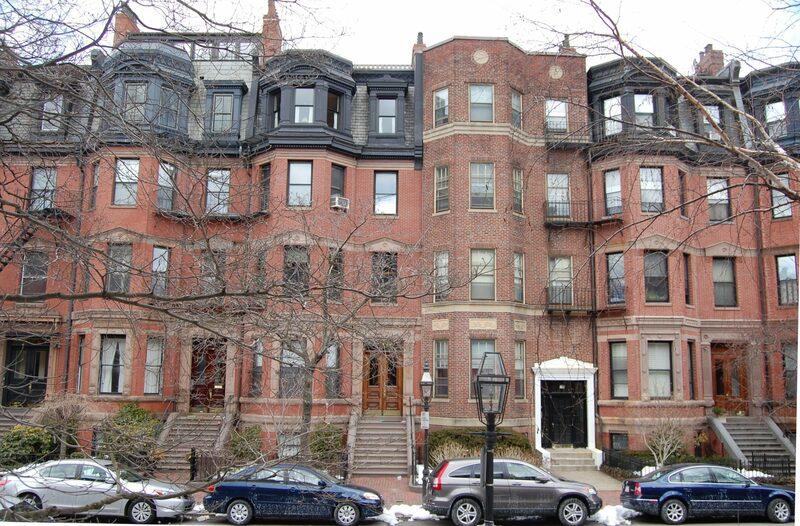 He moved to Brookline in about 1905 to live with his parents, George Kirby Hatfield and Mary (Kerr) Hatfield. He continued to live there until his marriage in August of 1910 to Eliza Salmond (Sylvester) Harraden, after which they lived at 410 Beacon. He continued to maintain his office at 129 Marlborough until 1941, when he moved it to 282 Berkeley (29 Commonwealth). Also from 1898, 129 Marlborough was the home of George Noyes Whipple. He previously had lived at 125 Marlborough. George Whipple was owner of a public storage warehouse and later became an advertising agent. By 1899, he had been joined by his mother, Elizabeth Ann (Noyes) Whipple, widow of George Whipple. They continued to live there in 1905, but had moved to 445 Marlborough by the 1905-1906 winter season. On July 18, 1924, Edward Briggs transferred 129 Marlborough into his and his wife’s names. Edward Briggs died in November of 1926. Ethel (McClure) Briggs continued to own 129 Marlborough as a medical office building. On August 19, 1941, 129 Marlborough was acquired by real estate dealer Eugene N. Siskind. That same month, he applied for (and subsequently received) permission to convert the property from offices into a lodging house and dwelling. By 1942, it was the home of Hilda Rachel (Clark) Wells, the widow of Ernest Woodbury Wells, who operated it as a lodging house. She previously had been a lodger at 24 Commonwealth. In 1946. she married John F. Curran, an engineer, who was one of her lodgers. He previously had lived in Maine. 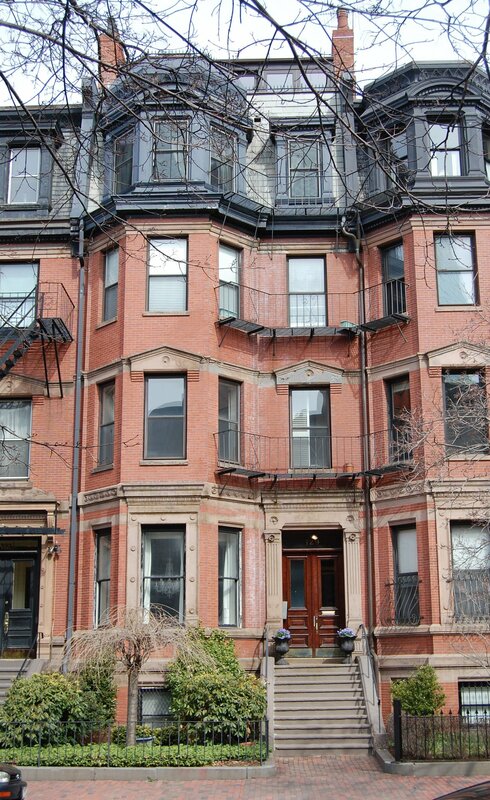 They continued to live at 129 Marlborough until about 1948. On October 6, 1949, 129 Marlborough was acquired from Eugene Siskind by James Joseph Moriarty and his wife, Julia Margaret (Doherty) Moriarty, who operated it as a lodging house. They previously had lived in Plymouth..
On June 14, 1963, 129 Marlborough was acquired from James and Julia Moriarty by Arthur Inman and his wife, Evelyn (Yates) Inman. They lived 8 Garrison. Arthur Inman was an author. He died in December of 1963, a suicide, leaving a 155 volume diary which was published posthumously as The Inman Diary. On May 4, 1964, 129 Marlborough was acquired from Evelyn Inman by Miss Mary Angela Cocuzzo and Miss Nancy A. Casey. Mary Cocuzzo lived in Brighton and was employed by the Mazzola Market in Brighton. Nancy Casey lived in Belmont and was an employee of the National Shawmut Bank. 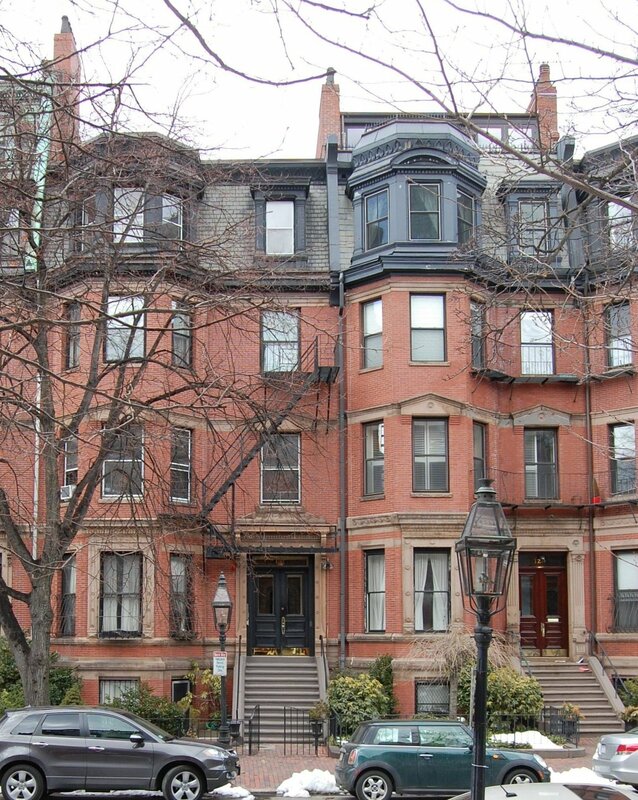 From the mid-1960s, they owned several Back Bay properties which they operated as lodging houses. On January 23, 1968, Mary Cocuzzo and Nancy Casey transferred 129 Marlborough and several other properties to Mary Cocuzzo’s first cousin, Francis Gerardo Mazzola, as trustee of the Mazz Realty Trust (Mary Cocuzzo was the daughter of Domenic Cocuzzo and Angela (Deluca) Cocuzzo, and Francis Mazzola was the son of Gerardo Antonio Mazzola and Maria (DeLuca) Mazzola). On August 8, 1973, 129 Marlborough was acquired from Francis Mazzola by Marshall L. Jainchill, and on May 1, 1975, it was acquired from him by Frederic S. Durham. On July 22, 1975, the house suffered a serious fire which resulted in the death of one resident, who fell from the fifth floor when the fire balcony connecting it to 127 Marlborough collapsed. The fire was attributed to arson and the victim’s death ruled to be homicide. In April of 1976, Frederic Durham filed for permission to repair the fire damage and convert the property from a lodging house into five apartments. The next day, his agent, Laurence Shapiro, filed an amendment also seeking to build a two car garage and add a one story addition at the rear of the building. Although they were allowed by the Board of Appeal, it appears that these additions were not made. On July 30, 1976, the property was acquired by Laurence Shapiro, trustee of the 129 Marlborough Realty Trust. On June 20, 1977, he converted the property into five condominium units, the 129 Marlborough Condominium.